Jimmy Holman of Sonora, Texas, brings ingenuity to ranch tasks by looking for ways to work smarter instead of harder. Efficient work tools make the difference. No, he isn't selling these ideas. He just wanted to share them with you. If you've built something that makes farm and ranch chores easier, send a photo. We'll share it with our readers. To same steps while feeding, Holman crafted a two-tiered feed cart. The dimensions are 38 inches wide by 46 inches long. Add 16-inch bicycle tires. Toss four bales of har on top. The 26-inch clearance between shelves easily carries six five-gallon buckets of feed. A time-saver like this could easily cause a fellow (or a gal) to whistle while they work! One size fits all goats, whether you're loading bucks into a trailer, does into a pick-up, or an entire herd into an eighteen-wheeler. This innovative ramp is lightweight, mobile, sturdy and adjustable. Wheels on casters allow easy mobility. 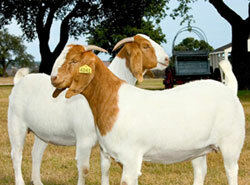 The goat fencing and pipe are easily accessible items that are ideal for the job. You're grooming your Boer for the show. With an aching back, you realize either you're too short, the goat is too tall, or the table is the wrong height! The solution? An adjustable, collapsible, portable stanchion that serves as a wash rack. Choose the most comfortable height and lock it in. Collapse it for packing. Roll it into position. Load it in the truck with the rest of your gear. At the show, with the guard rails and head holder pinned into position, just a few cranks of the winch and it's just the right height to groom any size goat comfortably. As my friend Laura Patton drove us across the Holman ranch on my first visit there, I had my hand on the door handle, ready to jump out and open the section gate ahead. "Stay put," Jimmy Holman directed. Laura skillfully touched the van's bumper to the gate, then drove on through. It was a first for me and I felt it was an idea worth sharing with our non-Texas dwellers. If you're still stopping at every gate that subdivides your land, getting out in all types of weather to open it and stopping on the other side to close it again, the bump gate will keep you in the driver's seat. If you prefer, you can add a cattle guard under the gate to ensure that your stock stays in the pasture. A word of caution! When I tried it later, driving Laura's Suburban, Jimmy Holman spent the next fifteen minutes taking the red gate paint off the side of her silver van. It does take some practice. The key to success is remembering, "He who hesitates is lost!" Don't ram it, but don't hesitate too long.